Some people swear all tethers are bad. Some recommend attaching a tether to robots in order to provide power (to save the mass and volume of the batteries), for reliable fast communications, transfer of pressure or fluid, to track a robot’s position, or as a safety harness (in case the robot needs to be dragged out). However, before designing a tether there are several things you need to consider. What should be in the tether? For example, can you put power on the robot and then only run communications to the robot? Tethers can easily snag on obstacles as the robot drives. This can cause your robot to get stuck and not be able to proceed forward or get back out. Tethers need to be managed so that you do not get snagged (as discussed above) and so that you do not drive over it, which can damage the tether. Tethers can get bulky. The longer the tether you need, the more mass and volume you will need to carry and the more heat you will produce. 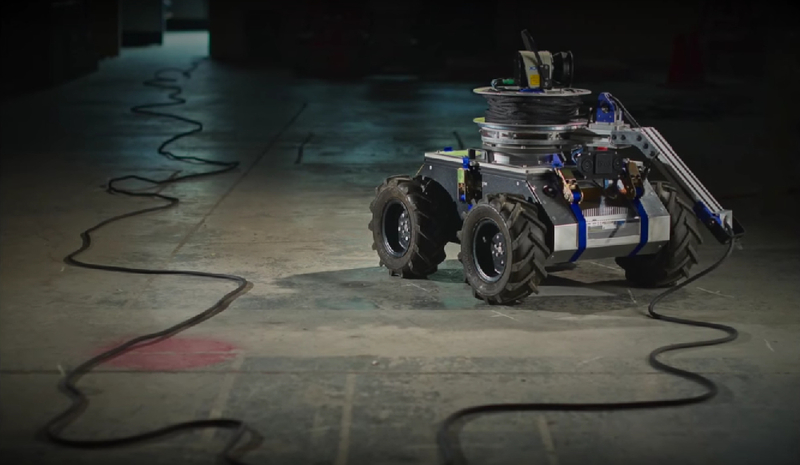 Tethers introduce drag, which the robot will need to overcome while driving. Abrasion of the tether with use. Cables, wire, and tubes in the tether can break which might incapacitate the robot. If the robot is going into a critical environment you might not be able to retrieve the robot should it fail. 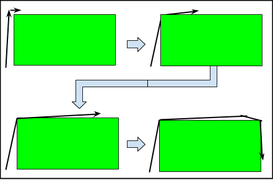 This image (to the left) shows how a tether can tighten around corners as the robot drives. As the tether gets pulled into the corners the force on the tether increases, and increases the chance of the robot getting stuck, breaking, and making mobility more difficult. Tension on tether base (neglecting the coefficient of friction from contact points) can be computed as shown below. Force on a tethered robot. This shows why it is much harder to pull a robot after it has gone around a bend. Can your robot support the volume/mass of the tether? Where are the snag points? Heat generated by the tether from I2R losses. This paper from Dante is a must read for anyone developing a tethered robot. Dante is a robot that flipped while trying to climb out from a volcano partially due to bad tether angles on difficult terrain. While people often point to Dante as an example of why tethers are bad, there are more examples of tethers being used successfully. In the nuclear accident of Chernobyl, a number of robotic (tele-operated) vehicles (robot pictures) were used in the recovery and cleanup. The robots were used for many things such as inspection, pushing radioactive material out of the way, turning over radioactive dirt and moving containers. Most of those robots were tethered (about 55 of the 60 vehicles). Many of those robots ultimately perished due to tether malfunctions, but that was after operating for extended times and doing good work. With new technology, better cable design, lower powered devices, better proprioception of the tether we should be able to do a better job building tethers. TReX is another paper that you need to check out before designing a tethered robot. This is not really related but it is an interesting video showing Chernobyl robots and video from them (at least I think, it is in Russian). I think tethers often get a bad name, however, they can be used. In order to use a tether, the design must be carefully evaluated and the concept of operations of the robot needs to be reviewed. Once the robot is built people need to monitor the tether while the robot is operating. The post Tether’s: Should Your Robot Have One? appeared first on Robots For Roboticists.